GOA: Sporting Clube de Goa has strengthened their squad with an injection of Goan Youth as they completed the signing of four Sesa F.A. players at the SCG Headquarters in Panjim, on Wednesday. 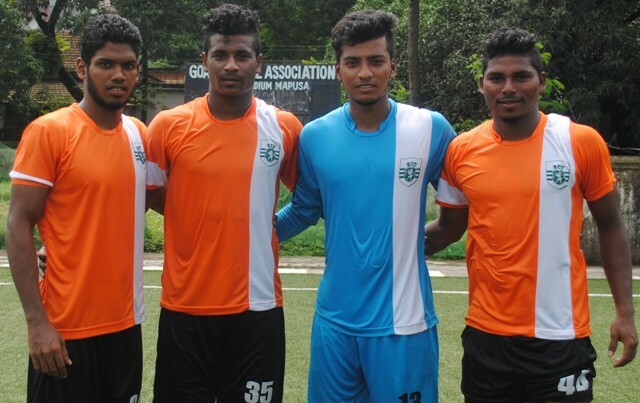 Ponif Vaz, Myron Pereira, Fayaz Shaikh and Isaac Negredo are the four diamonds that the Flaming Oranje will cut and polish with the hope of taking them to I-League standards. The 23 year old stopper, Ponif who hails from Fatorda has grown up watching Sporting Goa at the PJN Stadium and is delighted to be signing for SCG. “I want to cement my place in the Sporting Goa team and hope it becomes a catalyst for playing for the Indian national team,” reasoned Ponif. Ponif joined Sesa at 16 and has got three years of experience playing in the Goa Pro League. The highlight of his career was winning the Gold Medal at the Lusiofonia games with the Goa-India team last year. Ponif started his youth career with Salcete FC and has been part of the Goa Santosh trophy team for the last two years. Myron, the 20 year old Nuvem based stopper, played for Salgaocar U-14 before enrolling with Sesa at 16, with whom he won the Taca Goa U-20 League in 2013. “After Sesa withdrew the senior team it was a nervous time for us, but I thank the Sporting Clube de Goa management for giving us this opportunity,” informed Myron. 21 year old goalkeeper Fayaz is from Cuncolim and has represented Goa at the Santosh trophy this year which was a proud moment for him. “Representing Goa was an amazing feeling. I am now looking forward to playing for Sporting Clube de Goa,” said Fayaz. The 19 year old right back, Isaac studied at Don Bosco School in Panjim and played for the Don Bosco Oratory at U-14 and U-16 level. He later moved to the Vasco Sports Club U-18 side and eventually on to Sesa. “I am pleased to be back training at Don Bosco with Sporting Goa,” stated Isaac.